The route leaves the asphalt for one kilometer, following a dirt road initially, which then becomes a path to meet the asphalt road again. After a left turn, the last uphill straight of the street leads to the small chapel of Agios Konstantinos. After 50 meters, the road turns left, the asphalt stops and on the turn begins the path to “Koromilia – Petrostrouga”, which the race course follows. The vegetation at this point is shrubby and the small river of “Orlias (or Uralias)” is very close to the path. Soon the path rises sharply for a while and passes by the river at KM-7. There is a small water fountain "Itamos", right next to the path, where in an intermediate auxiliary station spring water is offered to the athletes. As the path moves away it begins to gain in height, through very dense vegetation. For the next 2 km the trail runs uphill in varying angle slopes and different types of vegetation, with the sound of the river coming from the depth of the ravine, on its right side. The path is well marked and the dense vegetation creates the feeling that a little further it is lost, but that does not happen. In the second natural loft that the path meets, there is a sign with the inscription "Orlias", and there is the 2nd Station ("Orlias", alt 740m ΚM-8,5). The slopes are wooded with various types of broadleaf vegetation, mixed with conifers. Immediately afterwards, and as the trail moves away from the Orlias gorge in a southward direction, the pine vegetation dominates. In KM-9,6 the path meets and crosses a dirt road twice, within a distance of 200 meters. The path meets the dirt road for a third time, at KM-10,1. From there the course follows the dirt road towards its uphill side, for 300 meters and reaches the location “Koromilia” where there is the 3rd Station (“Koromilia”, alt 980m, KM-10,4), just in front of the Koromilia Refuge. There is a time-out limit of 3 hours. The course follows the path again, which starts at the front of the Refuge, on its left sidewalk, climbing within low vegetation with bushy cedars and pine trees, which in a few dozens of meters they become large trees, forming a pine forest. The track at its beginning (first 30 meters) is hardly visible, but immediately afterwards it is well marked and as it ascends becomes even more wide and smooth. After 1.5 km the slope of the path, which progresses continuously on a wooded ridge, is diminished and among the pine forest the first beech trees are emerging. At the location "Bara", KM 13, the path passes through a large typical plateau lying in a dense beech forest. Then the path sharply turn to the left and rises upwards after a period of minimal climb. Here is the 4th Station ("Barra", alt 1.250m, KM-13). From the Refuge of “Koromilia” and up to here, there is a black hard hose that transports drinking water to the Refuge for its needs. The turns are continuous and irregular, in the direction of either right or left. At some point the trail comes out on a characteristic ridge of the mountain (location “Oxoula”) and for the first time one can see in a long distance in front of him/her some tops of the mountain (“Kalogeros” complex). The course proceeds for a while on a ridge and after passing a steep point with 3-4 concrete steps, it passes to the opposite side of the ridge to a northern slope. Shortly afterward, and while it actually continues on the ridge, the path makes a small “dive” and starts a steep uphill in a beech forest. Approximately in KM-14,5, the path seems to be lost as it spreads up in the beech trees. The feature here is the thick layer of dry leaves that covers the ground, but the marking is frequent so that there is no doubt about the right direction. The athlete has to climb up this slope and everywhere he will find appropriate signs. The end of this section is marked by the end of the beech forest and the entrance to the rocky forest, which is the pine tree with the white trunk that grows at high altitudes. The path quickly smoothes in inclination and moves into a landscape of sparse vegetation and sloping meadows. There is KM-15. Shortly after, the trail turns sharply to the left and leads uphill to an extremely sloping meadow at the site called “Petrostrouga”. Large rocky trees are sparse in this area, and there are some summer livestock farming camps. The tall grass and the nettles cover the path, but the 5th Station is visible in front of us (“Petrostrouga”, alt 1.940m, ΚM-15.3), just a few meters from the Refuge. 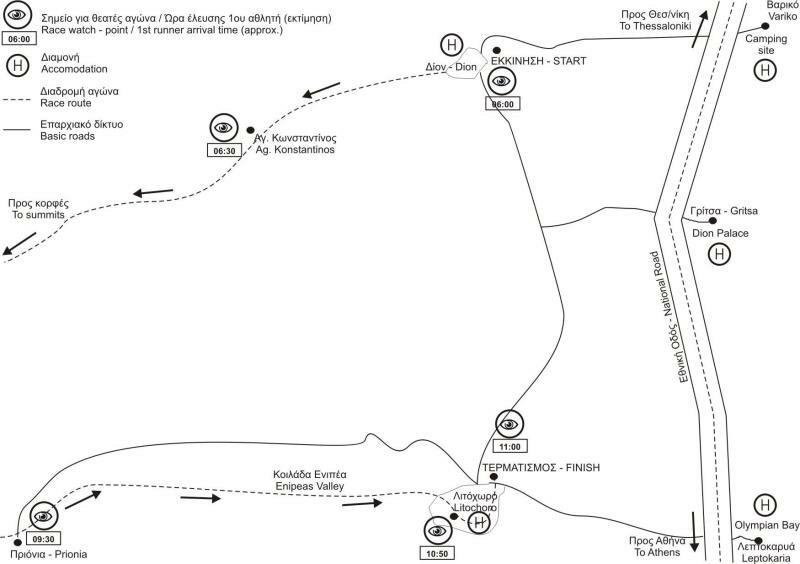 There we have to change direction and go completely west (leaving the Olympus Marathon route) and after 300m. we turn north. The path descends through a forest, passes through streams and comes to a ridge (sparse vegetation) called "Alataria" (alt 1.870m and a distance of 1.600m from “Petrostrouga”). From here the path turns west again and immediately after northwest. The sloping downhill steepens but the excellent dense coniferous forest is rewarding. Soon we arrive at “Paliokoprisies” and pass the characteristic stream of "Arapis". The altitude here is 1.590m. and the total distance from the start is 18.7 km. We climb slightly on the opposite ridge and continue downhill and north. We ignore a path that goes east (towards "Diasselo Elatos"). Soon we arrive at a glade at the "Tsirknia" location where there is the 6th station (“Tsirknia” alt 1.150m, KM-21,6). We completely change direction towards south. In the forest the path sometimes goes uphill and sometimes it descends slightly. Gradually we turn southwest. Eventually it acquires a western direction facing the "Papa" stream. As it descends with maneuvers, it turns to north (at 25.2 km. we ignore a path that goes south to “Papa Aloni”). Going down towards the stream, on our right (east) at 25.6 km, there is a path towards “Ag. Apostoloi”. We ignore it and follow the path to the “Krevatia” Refuge. We pass the stream (lower altitude 790m) and ascend to the north. The slope gradually becomes gentle and so in 3km we gain 215m in altitude. We reach the 7th Station (“Krevatia Refuge” alt 1.005m KM-28.9) where there is an exclusion limit of 8 hours. From here it begins a steep uphill (south direction) in densely wooded path. The goal is “Barbalas" peak at an altitude of 1.842m which we will reach after 3,3 km. We continue on "Rachi Papa" with a great view to all the northern side of Mount Olympus and the high peaks. The Rocky trees leave a wide passageway on the ridge where the trail moves slightly downhill in the beginning. Then we climb slightly and after crossing the top "1855" we reach a point where much attention is needed. At 34.3 km we must leave the ridge in the north direction and turn west with the aim of descending to “Xerolaki” stream. The path is relatively 'faint' and will take us down from an alt. 1870m on a dirt road at alt. 1220m. The 650m negative difference in altitude will be made in 3,1 km with repeated maneuvers. There is the 8th Station (alt 1.220m, KM-37,5). The dirt road that we follow has a southern course with a smooth uphill. At 39,7KM and at an altitude of 1.290m. (ie 2,2 km from the Station) we leave the dirt road and follow an uphill path. It is the well-known path of "Kopsi Skoliou". The slope is very steep and the path is wooded for the first 1,5 km. In the very steep and rocky section there are some structures (known as” red steps”) that help the climb. Especially for the day of the race there will be rescuers and there will be placed safety materials (ropes). After the altitude of 1.900m we are at an alpine landscape on a rocky terrain, but with stunning view. From the dirt road to the peak "Skolio" we will have traveled the hardest part of the race as we will climb 1.620m in a distance of 4,2km. At the top there is the 9th Station (alt 2.910m KM-43.9). From "Skolio" the route descends to the east and after a small traverse passes next to the peak "Skala". There begins a steep downhill on a flimsy (loose) dirt path in the south direction. Great attention is needed here as the slope is intense and the ground loose. At the end of this steep section, the trail turns eastwards and a traverse leads it to the central path that comes from the “Muses plateau”. Here at 45,9km. (alt 2.470m) we meet the course of Olympus Marathon and we follow it. The path from here is well marked but with a lot of broken stone (pebbles) that can make it difficult for the athletes, especially those who are stressed by the uphill. It proceeds with several zigzags as it moves on a ridge, called the “Chondromesorahi”, which has rocky trees, sparse and low in the beginning but they become denser as the path descends. On our left we have the view of the high peaks of the mountain. After another 1,5 km and while the vegetation becomes denser and the trees are taller, the path leads us to the refuge "Spilios Agapitos" or "Refuge-A", where there is the 8th Station ("Refuge-A", alt 2.060m KM-47,4). This refuge is well organized and operates six months a year, offering everything to the hikers. The rocky and rough downhill trail continues in a pine forest without a trace of running water, with the path leading to many abrupt downhill turns, but without any risk for a serious falls. Extra attention must be paid to the metal poles that used to hold pieces of tree trunks in order to form steps but now are left “naked”, creating risk for painful falls, as they are barely visible. At this point athletes will face the problem of the midday heat. At KM-49,6 the path becomes flat and enters a beech forest, relieving the athletes. From this point onwards and for the next 2.5 km, the path proceeds with smaller downhill slopes in a beech forest mixed with pine trees to reach the location "Prionia", where the 11th Station ("Prionia", alt 1.130m, KM-53,4). Here is the third exclusion limit of 15:45 hours. Here are the springs of the river “Enipeas”. The flow of the river follows the course of the race in its last section. The site “Prionia” is accessible by an asphalt road from Litochoro (18km) and allows friends of the contestants to attend as viewers and to support the athletes that they accompany. The last section of the race evolves into the “Enipeas” gorge and offers a lot of coolness to the athletes, due to dense vegetation and frequent contact with the river and the various springs in the riverbed. River water is drinkable and safe for athletes, as the river supplies with water the city of Litochoro. The slope of the path is gradual and the feeling that it evolves right next to the river creates a positive mood to the athletes. 3 km after Prionia is the monastery of “Agios Dionysios”, and at a distance of 1KM, the path passes through a characteristic open cave with a spring called "Agiasma". Then the trail continues into a very dense beech forest and crosses the river at four successive points over wooden bridges in order to avoid the steep banks. After the last bridge the trail moves on the south side of the valley. The athletes now have the river on their left hand side until they reach Litochoro. The route is gradually moving away from the river which is no longer visible but only audible in the background. Approximately 0.7 km after the last bridge, there is the 12th Station ("Kastana", alt 705m, KM-59,4), on the bank of a secondary stream that later joins the main river “Enipeas”. There is also another wooden bridge (the last to Litochoro) and a stone faucet out of operation. For a while, the path proceeds in a dense beech forest and makes small “ups and down” while the “Enipeas” ravine becomes a canyon with very steep slopes under the trail, but they are not perceived due to dense vegetation. A rough rocky steep downhill leads the path at a low altitude, passing through a characteristic slope with broken stones (pebbles). At the end of this downhill, the trail reaches just a few meters above the bank of the river, and this is the last time that the river is visible. Immediately afterwards, a significantly steep uphill begins in dense vegetation but the path is excellently engraved and it passes under a natural tunnel, formed by the medium height trees of the area. After 1,2 km from the point of this last approach to the river, the path passes through a “gate-like” formation (this is the location “Portes”). From this point on, someone has a visual contact with Litochoro for the first time, which seems to be not far away. A steep downhill slope with a lot of crushed stones and rocks leads quickly downwards, where the vegetation becomes shrubby and the image of the “Enipeas” gorge on the left is visible. In 2 km as we pass through a cave-like formation, there is a characteristic right turn (there is a stone bench), we see a junction in front of us. Here we follow the secondary path to the right and not the main one that turns downwards to the left. The path proceeds progressively uphill, with some straights, for the first 150 meters, and then it turns to right (90 degrees) and uphill for 100 meters, entering into a pine forests. As the uphill ends, the houses of Litohoro are now visible through the vegetation, and the path moves in a straight line for another 500 meters. Then the path comes to a bushy vegetation and it descents, as it crosses a dirt road. We descend through the meadows for 300 meters and we reach the first houses. Moving now on city roads we pass through the “National Resistance Square”, the “Chostostouli”, the historic “1st Primary School” next to the church of “Agios Dimitrios”, and finally we descend to the Central Square with the fountain, and after 300 meters reach the Central Park of Litohoro (Municipality Park), where there is the finish line (time-out limit of 19 hours).